I’m not a huge chicken teriyaki fan, but I do like the combo of fresh vegetables and umami’ed up chicken in this one. Plus, it’s quick – you can make it on a weeknight. Whisk 2T sake and cornstarch. Add chicken, toss to coat. Heat 1T oil in a 12″ skillet until shimmering. Add half of the chicken in a single layer and cooking without stirring until browned, about 3 minutes. Flip chicken, cook another 2 minutes. Transfer to bowl, repeat with remaining chicken. Return skillet to medium heat, add mirin, tamari, remaining 2T sake, and ginger. Bring to simmer and cook, stirring and scraping up brown bits until spoon drawn through leaves trail, about 5 minutes. Return chicken and any accumulated juices to pan. Add pepper and cook, stirring until chicken is glazed, about 4 minutes. Season with additional tamari to taste. Divide rice amongst 4 bowls. 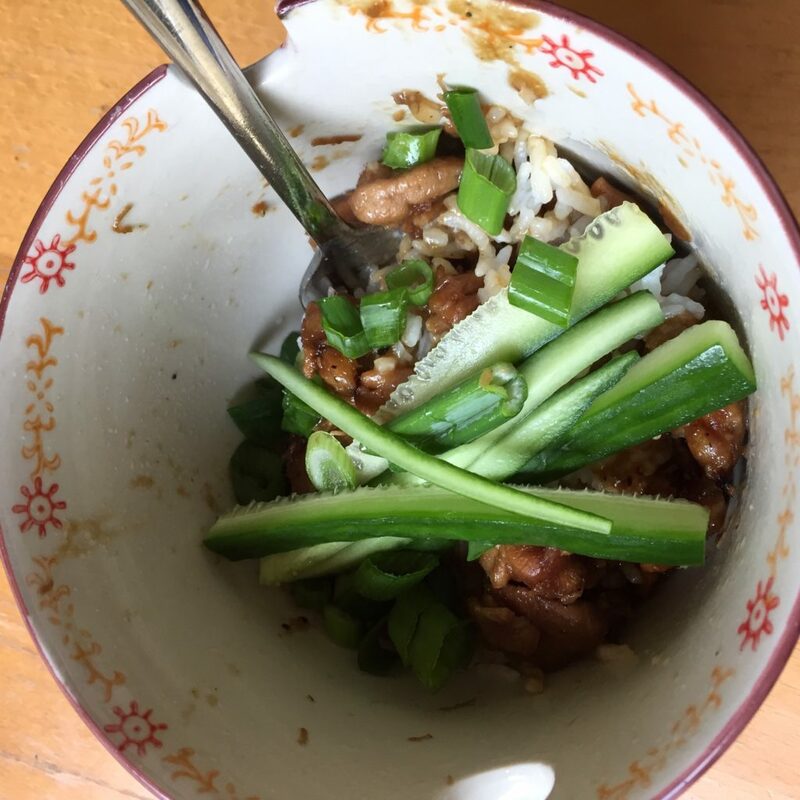 Spoon chicken over rice, top with cucumber, scallions, and sesame seeds. Recipe from Milk Street’s Tuesday Nights cookbook. It’s worth your while to pick this one up. Trust me.